Hamburgers are one of the most popular foods in America and, according to National Public Radio, Americans consume about 14 billion burgers each year. 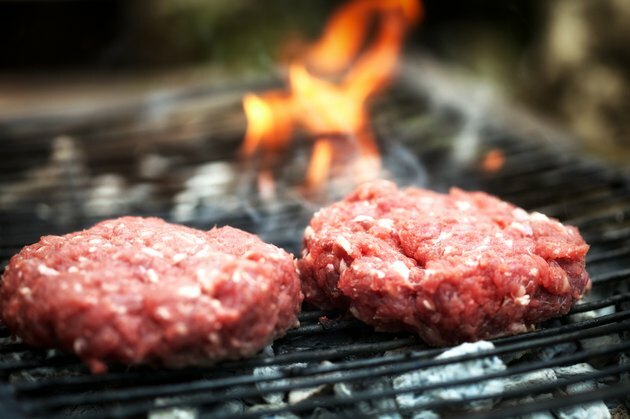 You cannot drive through your local town without finding at least one fast food hamburger restaurant, and hamburgers are a staple at most summertime barbeques. How you eat your hamburger can vary, from a plain burger with the addition of condiments such as catsup and mustard or loaded with cheese, tomatoes, lettuce and bacon and so much more. The traditional hamburger bun is made from white bread. Looking at a serving of two large pieces of white bread, the calorie count is 160, protein is 4.58 g and 30.37 g of carbohydrates. Vitamins and minerals include calcium, iron, magnesium, phosphorus, potassium, sodium, fluoride, selenium, folate, lutein and vitamin K. The average white bread bun does not contain any cholesterol and provides a variety of amino acids. The main meat used for a traditional hamburger is ground beef. Looking at an 8 oz. serving of 95 percent lean ground beef, the calorie count is 310 and a protein count of 48.41 g. Vitamins and minerals include calcium, iron, magnesium, phosphorus, potassium, sodium, zinc, fluoride, selenium and small amounts of the B vitamins. Beef also provides a wide assortment of amino acids and 140 mg of cholesterol. Bacon is often used to top a hamburger. A one slice serving of bacon provides 42 calories, 3.03 g of protein, 192 mg of sodium and 9 mg of cholesterol. Ketchup and mustard are traditional hamburger condiments, though mayonnaise is also used regularly. A 1 tbsp. serving of ketchup contains 15 calories, 3.77 g of carbohydrates, calcium, vitamins A and C and 2,506 mcg of lycopene. A 1 tbsp. serving of yellow mustard provides 3 calories and 0.27 g of carbohydrates. A 1 tbsp. serving of mayonnaise contains 103 calories and 11.67 g of fat. Tomatoes and lettuce are two of the top vegetables added to the traditional burger. A ¼ inch tomato slice provides 4 calories, 0.78 g of carbohydrates, 47 mg of potassium, 2.7 mg of vitamin C, 90 mcg of beta carotene, 167 IU of vitamin A and 515 mcg of lycopene. A large leaf of iceberg lettuce provides 2 calories, 0.45 g of carbohydrates, 3 mg of calcium, 21 mg of potassium, 45 mcg of beta carotene, 75 IU of vitamin A, 42 mcg of lutein and 3.6 mcg of vitamin K. American processed cheese often is used on hamburgers. A 1 oz. slice of American cheese provides 94 calories, 5.57 g of protein, 6.93 g of fat, 2.36 g of carbohydrates, 141 mg of calcium, 113 mg of phosphorus, 103 mg of potassium, 274 mg sodium and 200 IU of vitamin A.